3 Bedroom, 2 bath secluded Cottage with tennis court out the back door. Architect designed three bedroom cottage located in the midst of exclusive area of large historic estates in Amagansett. Very quiet neighborhood. Cottage is available in three possible rental arrangements: as a summer rental; or as a full year rental; or as a nine-month off-season rental at greatly reduced rent. 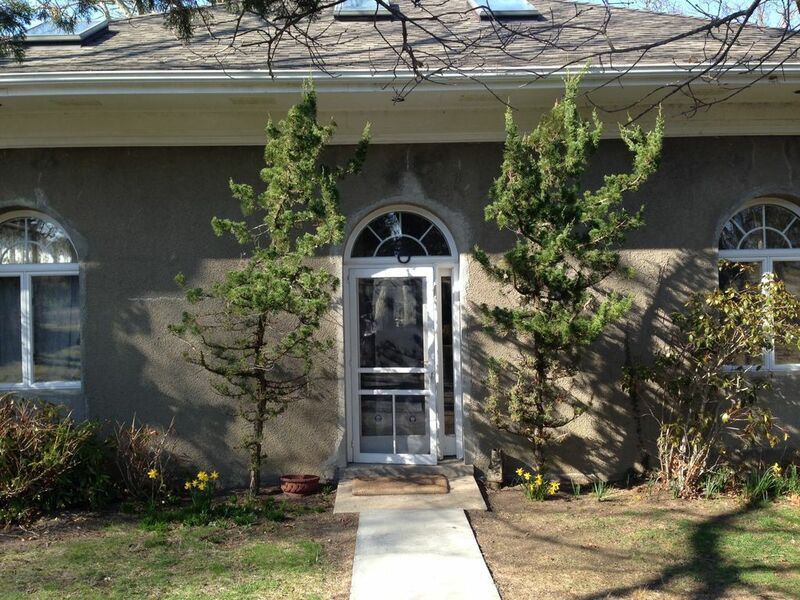 Cottage located in highly desirable Amagansett School District. Sleeps 6 comfortably. Bedrooms include spacious downstairs master with king bed and working desk (6 feet long). Second large bedroom on second floor with queen bed. Third bedroom, also second floor, is a smaller bedroom with two twin sized beds. Full bath and laundry upstairs. Another bathroom downstairs. Cottage features large living room with comfortable seating for 6, or many more with additional chairs easily available from adjacent dining area. Kitchen is long and narrow, as shown. Kitchen is fully equipped and features handcrafted teak countertops. Dining table is on one side of living room; separate outdoor dining table with Weber barbecue also pictured. Both dining tables have seating for 6, so total dining capacity of 12 at the two dining tables if desired. Living-dining-kitchen area is an open floor plan in which a custom woodwork wall shelters the living room from kitchen activities. Cable and Wi-Fi with high speed internet included. Dedicated parking area at cottage good for 2 or 3 cars. Cottage tenant has use of tennis court with clay surface (Har-Tru surface). Court is located 100 feet away from cottage in beautiful tree lined setting. Use of court is shared with occupants of larger estate residence on a four acre property, of which the cottage is part. Tennis court is rarely used. Tennis rackets, tennis balls, beach chairs and other amenities available upon advance request, free of charge. Cottage location is among the most ideal in the Hamptons for beaches, restaurants, shopping and nightlife. Within a mile or two, you will find the best selection of ocean and bayside beaches in all of the Hamptons. This is made possible by the uniquely close proximity of the Atlantic Ocean and Napeague Bay (famous for kite surfing and windsurfing), which are separated by less than a mile here. The Napeague area is 1 mile east of our cottage. Atlantic Avenue and Indian Wells ocean beaches are 2 miles west. Restaurants and shopping are also outstanding because our cottage is in the middle of a triangle featuring four or more nearby Hamptons villages, each with a different, interesting vibe: Amagansett (2 miles west); East Hampton (5 miles west); Montauk (10 miles east); and Sag Harbor (15 miles north). Montauk night scene is particularly famous. A fifth hamlet, Springs, is about 7 miles north--famous for artists including Jackson Pollock, Lee Krasner and Willem de Kooning. Grocery shopping is readily available in large store 1.5 miles away. No need to go beyond Amagansett for basic needs (restaurants, groceries, pizza, wine, great coffee and muffins at Mary's Marvelous, Stephen Talkhouse nightclub and more). Excellent Farmer's Market open in summers in three places: East Hampton on Friday, Montauk on Thursday, Springs on Saturday. My 5 brothers and sisters ands I own this property. It has been in the family for over 100 years. It used to be a carriage house for our house up the hill. This property offers seclusion as well as being situated in the Amagansett school district. There is a tennis court right out your back door which is available for your use. My husband and I rented this cottage for the month of April. We wanted to acquaint ourselves with the easterly part of Long Island. The house accommodated us very nicely. Lucy always answered my emails in a timely fashion, and was very nice. The property is in an estate section very close to Ocean and Bay Beaches and the town of Amagansett.